The Ohio Republican told members he was working hard and didn't want to turn around and not see an army behind him. House Majority Leader Rep. Eric Cantor of Virginia also said it was time to pull together and pass the House GOP debt bill, instead of feeding a storyline that pits Republican against Republican. But the meeting turned into exactly that-a venting session with Republicans turning on each the other-and exposing an ugly split among the rank and file. Several members were furious when they learned that staff members for the Republican Study Committee - a group of fiscally conservative lawmakers - sent emails to outside groups encouraging them put pressure on fellow Republicans to oppose Boehner's plan. Ohio Republican Rep. Jim Jordan, who heads the group, apologized at the start of the meeting, indicating his staff sent the emails without his knowledge, according to GOP sources. After he spoke, several members shouted that Jordan's top aide, Paul Teller, should be fired. House GOP sources told CNN that one of the emails, sent by a junior RSC staffer, included a target list of 30 RSC members and urged outside groups to lobby against those Republicans back in their districts. In addition, Teller emailed these groups after a GOP meeting Tuesday to alert them that the House GOP plan, which Jordan had already publicly opposed, was gaining support. One RSC member on the target list, Indiana Republican freshman Rep. Todd Young, stood up at Wednesday's meeting and asked why he was paying dues to a group that was now attacking him. Oregon Republican Rep. Greg Walden stood up and read Teller's email out loud and asked him to explain, but according to Republicans in the meeting, he declined. Jordan told reporters he did not know the emails were sent. Brian Straessle, spokesman for the RSC, apologized in a statement. "Earlier this week, an RSC staffer sent an inappropriate email to outside groups that identified members of Congress he believed were undecided on the debt reduction proposal offered by the Speaker. This action was clearly inappropriate and was not authorized by the Chairman or any other members of the staff," Straessle said. "This has never been – and never will be – the way we do business at the RSC. We apologize to everyone affected, and we have already taken steps to ensure that it never happens again – either by this staffer or any other RSC staffer." While the blow up over the emails highlighted the division in the GOP ranks, there were also signs that Boehner and his leadership team were gaining support for their bill. Ohio Republican Rep. Steve Chabot had said he was leaning against it, but with the deadline closing in, and facing a Democratic Senate and White House, he told CNN Wednesday he was now inclined to support it in order to avoid a default. One conservative freshman Rep. Blake Farenthold, R-Texas, who noted Jordan was probably counting on him to oppose the bill, said he was leaning yes, telling reporters, "Don't let the perfect get in the way of the doable." 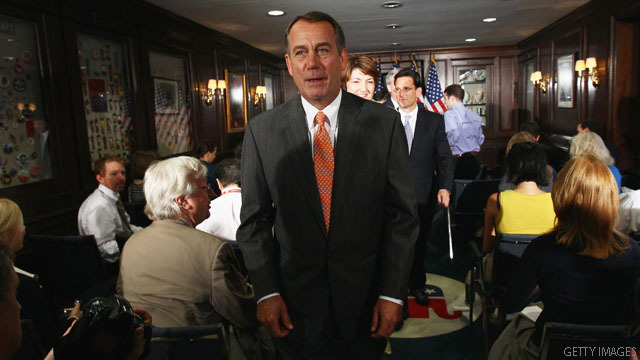 Republican leadership aides were scrambling Wednesday to rewrite the bill to add more spending cuts. They pledged the bill would meet the speaker's test that the spending cuts in the measure exceed the amount of the debt ceiling increase. A Congressional Budget Office report released late Tuesday stated the bill fell short of that, but House Budget Committee Chairman Rep. Paul Ryan of Wisconsin walked through the numbers at the Wednesday meeting and explained leaders were tweaking the bill to make it reach that target. Leaders are still aiming for a vote on Thursday. Youleft off the first part of his statement- "Screw America..."